Consistently ranked among the top 2% of brokers nationwide and repeat members of the Multi-Million Dollar Club. Wall Street Journal: "Bay Ridge Keeps Focusing on Old and New"
With more than 30 years combined experience and nearly $350M in sales, the Mendelis Saliba Team is devoted to providing impeccable customer service, a second- to-none level of professionalism and in-depth market acumen to each of their clients. 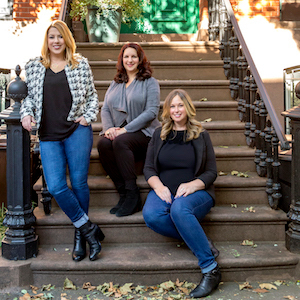 Comprised of long-time friends Lori and Clare -- both native New Yorkers and Fordham University graduates -- the team has garnered industry recognition and are experts in townhouse, condo and coop transactions throughout Brooklyn and Manhattan. Both have an unmatched attention to detail and strive to create a seamless process for sellers and buyers alike while valuing the personal connection above all. Lori is known for being incredibly responsive, flawlessly prepared and a consummate problem-solver who relies on good humor and positivity to make what can be a stressful process much more enjoyable. She lives in Windsor Terrace near Prospect Park with her husband and their Cavalier King Charles Spaniels. Equal to her dedication to NYC real estate, she loves to escape to their tiny cabin in the Catskills. Brooklyn-born Clare has a background in media and is known for her exceptional interpersonal skills, analytic insights, endless patience and ability to facilitate complex deals. She lives in a prewar townhouse in Bay Ridge with her husband and two dogs and enjoys spending free time at her beach house on the East End. The newest member to join the team is Lauren Fernandes. Lauren brings over 15 years of experience in digital advertising and client service. She uses her skills in client management to help her buyers through the home buying process . As a condo owner in Williamsburg, Lauren understands the sense of achievement gained by owning your home, and loves to help others acquire their own piece of NYC, too.